Sperlonga is a coastal town about 80 km (50 miles) up the coast from Naples, just above Gaeta. Sperlonga is not in Campania but rather in the province of Latina, one of the five provinces in the region of Lazio (of which Rome is the capital.) 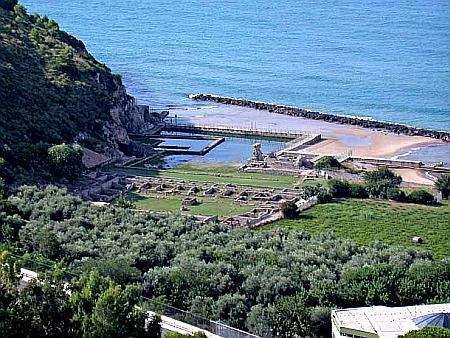 Sperlonga is near the Via Appia and also on the edge of the Pontine Marshes. Those marshes were greatly reduced in the 1920s and 30s by land reclamation projects, but at the time of the Romans, the only thing the area was really known for was a cave, “spelunca” in Latin, and if you are a modern spelunker or otherwise interested in speleology, I'm not telling you anything you don't know. There was a Roman villa near the site during the Republic, but it was later taken over by the emperor Tiberius (42 BC–AD 37, the second Roman Emperor, from the death of Augustus in AD 14 until his own death in 37). (A villa in this sense is not just a single building, but a large piece of property with various structures—more like an "estate" in English.) This property included the cave, the grotto. The term “Villa of Tiberius” is probably more associated with his later acquisition on Capri, which is where he removed to after the roof of the grotto in Sperlonga collapsed while he was dining. Sejanus rushed to save Tiberius, for which Tiberius in gratitude promoted him, launching Sejanus' rise to power to become head of the famous Praetorian Guard. So, for a while there, Sejanus got a good deal from an emperor who was notoriously vicious and paranoid. Tiberius kept his reputation intact by later having Sejanus executed anyway. In any event, whatever Tiberius' defects, and as historically interesting as his villa on Capri might be, the main cultural attraction in Sperlonga is now the The National Archaeological Museum of Sperlonga and of the Grotto of Tiberius. It was built and opened in 1963 specifically to house the great number of sculptural groups of Homeric subjects found in 1957 during construction of the coast road between Terracina and Gaeta. The find was so spectacular that they built this fine museum just to keep the treasures out of the clutches of the infamous central culture vultures in distant Rome. ("Hey, you people haven't even got a museum. Let us take this stuff off your hands for you!") The entire museum was designed from scratch with a precise space for each sculpture to be housed, while also providing suitable premises for the restoration and assembly of the thousands of marble fragments found. In part, they are still in the process of reconstruction. It bears emphasis that in many case, the sculptures are not Roman copies of Greek originals; they are, themselves, originals from the Hellenistic age (c. 180 BC). 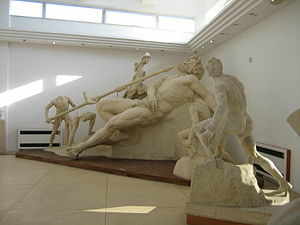 The villa (including the grotto, itself) yielded sculptures of, for example the assault of Scylla on Odysseus' ship, the blinding of Polyphemus (pictured), the theft of the Palladium and Odysseus lifting Achilles' corpse. There is debate among scholars about precise attribution, but the find was spectacular. The villa had several buildings arranged on terraces facing the sea. The first structures are related to a villa of the late Republican period. There is also a series of circles around a colonnaded courtyard that had service areas, a furnace and an oven for baking bread. Somewhat later a long portico was added and the natural cave that once stood at the entrance to the villa was framed by an architectural design and was partially transformed with masonry and the placement of sculptures. 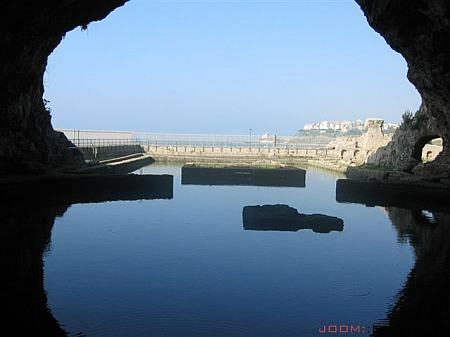 The cave includes a large main cavity, preceded by a large rectangular tank (fish pond, pictured below) with sea water, the center of which was built on an artificial island that housed the caenatio (dining room). I believe I heard that Tiberius had a series of piscine [pools, pictured below] constructed so that salt water fish (black Mullet were mentioned) could be gradually habituated to fresh water by moving them consecutively through a series (7 or 8?) of progressively less saline pools until they could finally survive contentedly in fresh water, and ultimately be served as fresh water fish at the emperor's table. If that is what tour guides tell visitors to Sperlonga, it is roughly accurate, but they may have fudged on the biology, maybe just to push it past the casual tourist, hoping, of course, that no marine biologists were in the group. The key words are "gradually habituated," which is not what happened. I don't know if the Romans actually knew what was happening. If they thought they were changing one kind (species) of fish into another, they were wrong. New species do not arise when the environment forces single organisms to adapt that then pass their adaptations on to their offspring. (That would be called "the inheritance of acquired characteristics," once a popular view of evolution, but now, since Darwin, discredited.) Speciation occurs because "natural selection" lets a few members survive who already are, by chance, immune to a potentially deadly change in the environment, in this case, a changed level of salinity in the water. They, the survivors ("the fittest") reproduce and are a new species. The old ones will have died off. top photo: steerpike; central photo: steveilott; bottom photo: "Looking Out," Fulvio De Marinis, Napoli Underground.